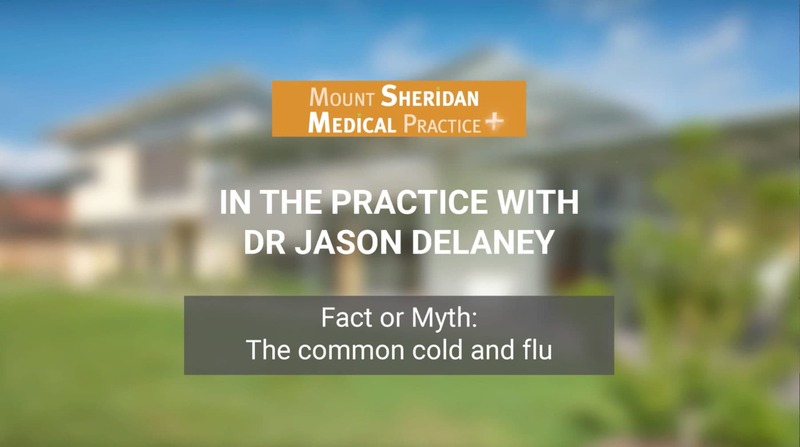 Dr Jason Delaney from Mount Sheridan Medical Practice takes a moment to discuss with you ways to avoid catching a cold or flu. The first and the most important one is to wash your hands. If someone with a cold or flu sneezes or coughs onto a surface, you then touch that and you can accidentally touch your mouth or nose and then infect yourself with the virus. So the best way to not get the virus is to wash your hands. There was a study in naval recruits, where they got them to wash their hands at least five times a day. In doing that, they reduced the number of presentations of the cold or flu by 45%. So, by simply washing your hands you can reduce your chances of catching the common cold or flu by almost 50%. The second way to try and prevent spreading the flu virus around is to stay home if you are sick. Don’t soldier on, the best thing to do is to stay at home, rest up, give your body the chance to recover. Don’t go to work and spread it to all of your work mates. They ‘re not going to be happy that you’ve given them the cold or flu. Nor would you be if your work mate coughs and splutters over you. So stay at home. The next thing is, if you are sick, then use a tissue whenever you cough or sneeze. That way you are catching the virus in the tissue and then dispose of it immediately in the bin and not spread it to others. Of course, the best way is not getting the flu in the first place and you can do this by getting immunised. This is a free immunisation if you are over the age of 65, if you have medical conditions such as diabetes that put you at an increased risk of getting an infection or if you are an Aboriginal or Torres Strait Islander or if you are pregnant. This is something that can be provided at our surgery for you and it’s the best way to stop getting sick. You can also get it if you want to just prevent yourself from getting the flu, so it is available to anyone over the age of six months of age and it is shown to reduce the number of sick days that you will have if you get immunised each year. The fifth and final way to try and get through the flu season is to stay healthy. A number of studies have shown if you have a good diet, sleep well, manage your stress, you are less likely to get the flu in the first place and you are also more likely to get over it slightly quicker.